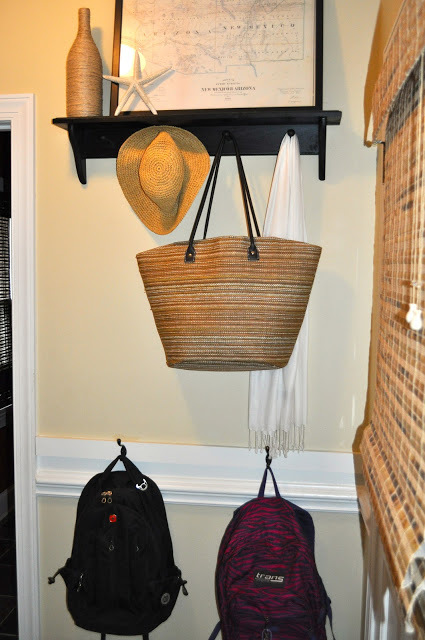 The Collected Interior: Mudroom organization...for less than $50! Mudroom organization...for less than $50! Back to school time is upon us! Are you thinking about getting more organized this year? Well here's the scoop on our affordable mudroom that literally cost just over $50. 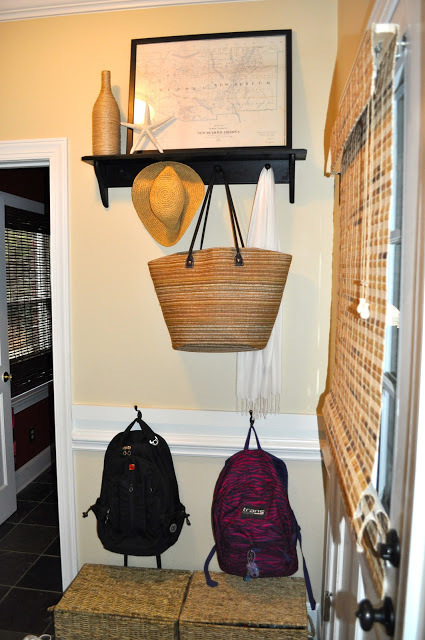 Have you ever wanted a mudroom or a place where the kid's can put their stuff away? Do you have an empty wall near an entry way in the side or back of the house? Well then you've got space for organization that mimics a mudroom. I know you've seen them in blog land and on Pinterest...those awesome mud room's, with bee-eautiful custom built-ins, and enough storage space for everything including the kitchen sink! I've seen them too, but immediately knew that custom built-ins were just NOT in our budget! So I set out to create a wall of organization in our small side entry, without those expensive built-ins, but with all the organization kid 1 & 2 need. And heck a little style wouldn't hurt either! Here we have much needed storage for book bags and shoes. The baskets are really just for flip flops and crocs, but every bit of storage helps, and I've been known to throw a toy or two in there as well! Here's the cost break down...the shelf I bought unfinished at Michael's (which I painted black) for $25, and the baskets each were around $15, then the Hubby nailed a piece of scrap wood just above the trim, which I then painted and added hooks. So in a nutshell, this project was simple and cheap! And the look on my face when kid 1 & 2 put their stuff away...priceless! What I *really* want to know is how you get the kids to put their stuff away? This is my first time joining. Thanks for hosting and I think your mudroom looks great and organized. This is my first time joining as well. I am so inspired by all of you. I have only done a couple of DIY stuff but my blog is all about saving money so I'm really wanting to expand this section as well. Keep the great ideas coming & thanks for hosting! Your mudroom is fabulous! I love the framed map and baskets...chalkboards too! Thanks for hosting! This is a fantabulous solution that looks great. And if your children join in by putting thier things away...whoo-hoo! Fabulous and frugal, Jane! I love the story behind the map and it fills that space nicely. I think it's great that you put a lot of thought into what you knew you wanted and did it. Plus, you got your dining room back ~ win, win all the way around! Jane, it looks great! I really like your idea of writing your kids' names on little chalkboards - I'm sure I would have agonized over how to label their baskets, but your way is so easy and also easy to change later if needed. Good work! Thanks everyone! Jessica I just realized those chalk boards still aren't attached! I'm planning to drill small holes and attach them with wire. Ugh...my work is NEVER done! But organization IS an amazing thing! I love, love, love that twine bottle! Have to give that project a go! Jane - I'm so glad I found your blog - you became a follower of my blog a few weeks ago but for some reason when I clicked on your profile I didn't see your blog. Anyways - I love your mud room. I really like the map. I'm going to find something to join your next party! I love the map, too. 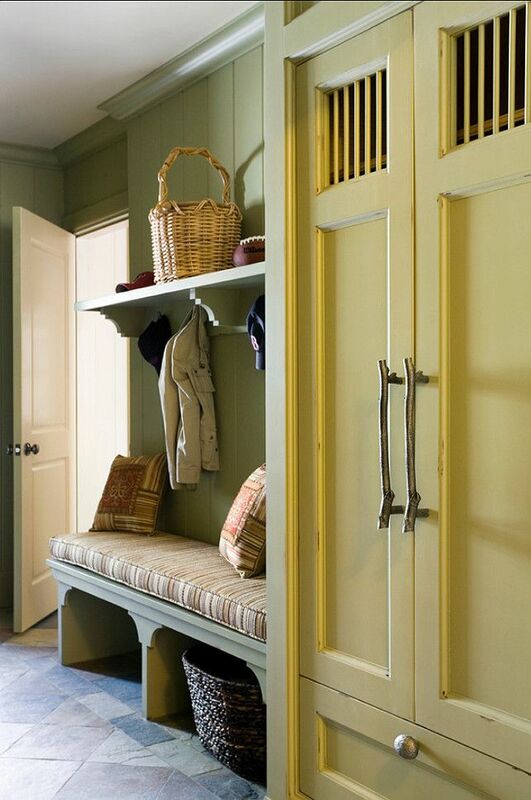 This mudroom totally works - great, awesome! Your mudroom looks awesome! I can't wait to get a spot set up for backpacks, shoes and coats. Our house has one tiny coat closet and it just won't cut it. This is some great inspiration! It looks so well organized now and I love the way you accessorized! This is a fantabulous solution that looks so nice! This is so beautiful! You really thought of everything!